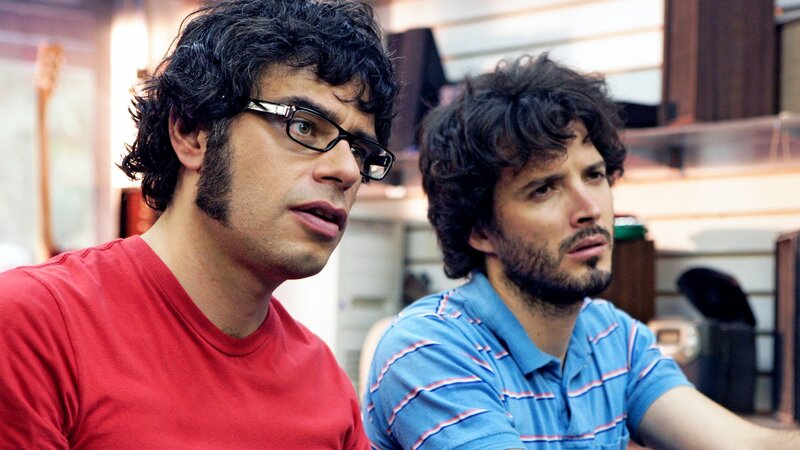 Bret and Jemaine search for romance and a gig in New York City. Bret's commitment to his new day job forces Jemaine to search for his replacement. Bret loses Jemaine's trust by abandoning him to a gang of two. Bret's girlfriend threatens the Conchords' fragile chemistry and the devotion of their only fan. Jemaine reconnects with the girl who dumped both him and Bret; Murray finds investment opportunities in the stars. David Bowie, Mel and Jemaine give Bret help with body issues. Bret and Jemaine fight a race war; Murray falls for the tech-support woman. Bret and Jemaine meet two women at a croissant shop; Murray makes an album deal for the band. 9. What Goes on Tour? Murray organizes a tour in preparation for a big gig in Central Park. The Conchords triple their fan base after playing a local world-music jam. Bret and Jemaine enlist an actor to cheer up Murray after a disappointing gig. Murray forces a bongo-playing band member on Bret and Jemaine.